Fly Fishing legend Gary Borger was our 2006 Annual Banquet speaker! The dinner was held at Dominion Power's Innsbrook facility. Click here for directions. Gary held a pre-dinner discussion on 'Stream Tactics with Nymphs'. Thanks to everyone that contributed to our Annual Conservation Raffle! Reprinted below is an article by Lee Graves, the Outdoor writer for the Richmond Times Dispatch that was published on 1/27/06. Gary Borger scoffs at the notion of anglers having to outsmart fish. The IQ of a brown trout is around 6, he said. "Fish are not people," and they don't think like people. So while the average fly fisherman frets about tippet diameters, hook sizes, matching the hatch and presenting the fly artfully, the average trout basically ponders one simple question. Food, or not food? To that end, Borger led a group of about 15 fly-fishing aficionados through the finer points of fooling fish, trout in particular, with nymphs. The Saturday afternoon session was a prelude to a talk that evening at the Fly Fishers of Virginia annual banquet. Borger, professor emeritus of biology at the University of Wisconsin in Wausau, wrote one of the definitive works on nymphing. 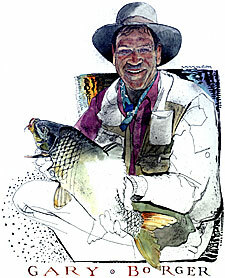 He has penned other treatises on fly fishing, made videos, written articles and traveled the world. 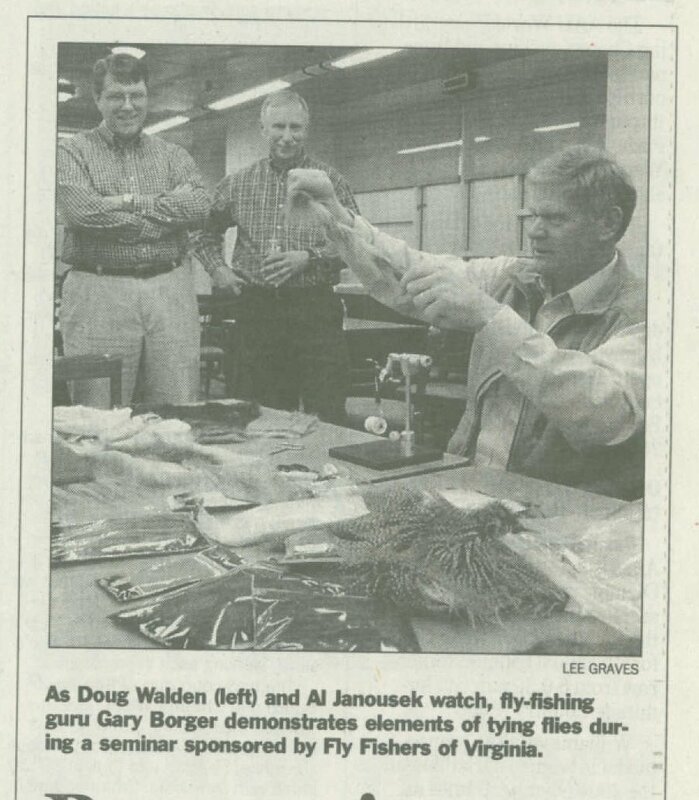 And when filmmakers needed a fly-fishing expert for "A River Runs Through It," they turned to Borger (actually, it was son Jason who made Brad Pitt's angling exploits look believable). All in the pursuit of a passion that started when he was a boy in Pennsylvania. "My mother took a photograph of me and my brother fishing in a puddle by the house," Borger said with a chuckle. That passion was evident Saturday as he dispelled notions that fishing with nymphs is more difficult than with dry flies. "People don't understand it, and because they don't understand it, they think it's hard," he said. To a biologist, a nymph represents a particular stage in the life cycle of an insect. To an angler, it's any imitation of a subaquatic invertebrate. And while fishing with a dry fly is surface-oriented, fishing with nymphs goes below the surface. That presents visual challenges - seeing a strike - and requires different tactics. Two stressed by Borger are the greased leader technique and the strip tease tactic. The first requires rubbing your leader with fly floatant. It will stay on the surface and can help indicate a strike. The second simply means stripping the line while giving the nymph a teasing action with the rod tip. "It's the best still-water tactic of all of them," Borger said. In addition to Borger's afternoon seminar and evening presentation, highlights of the FFV event included two awards. Dan Downey, a James Madison University professor, received the Taylor Turner Conservation Award for helping develop liming techniques used to temporarily counteract the effects of acid rain on several trout streams in Virginia. Bob Gooch of Troy received the Nat Burgwyn Lifetime Achievement Award for his articles and books spanning 40 years of outdoor writing. He was praised for espousing good sportsmanship practices among anglers, educating youth and preaching conservation. Turner, now deceased, was a past FFV president. Burgwyn is a founding member of the organization.